We provide custom refinished and repurposed furniture. 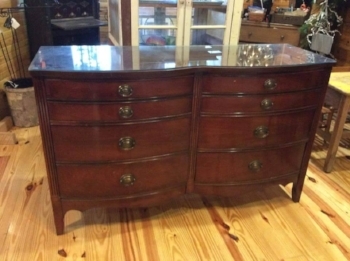 We also provide repair and restoration for your favorite vintage or antique furniture. Here at Vintage on the Hill, we strive to find unique pieces that will blend with the décor you wish to achieve in your home. We can refinish any of our store pieces to match your décor, or if you have a piece of furniture that needs some updating, we can tackle that project as well. We strive to meet everyone's schedule on furniture refinishing, so please call to set up an appointment to drop off a piece of furniture you would like us to work on as we are limited on space. It is our goal to have your furniture back to you as quickly as possible. A table is a place in the home to gather with one's friends and family. It is a place to share a meal, and to create cherished memories. You could argue that it is the heart of every home. At Vintage on the Hill we take this very seriously. We want to work with you to create the perfect gathering place for you and your loved ones. A place where laughter and memories will not be in short supply. We will walk you through our process letting you design your table from start to finish. You get to pick everything from materials to finishes. Give us a call or come by the shop today to let us start your project! This table and bench were created for some of our clients. The top was stained in a carbon grey while the bottom was painted in a white ash, and then distressed. We also painted and recovered their chairs to match the finish. Our selection of Farmhouse Paint. This is the most amazing paint for furniture! Let us teach you how to use it! Have you ever wanted to change the look of a piece of furniture, but have not had the knowledge or confidence to do so? Let Vintage on the Hill help you make your DIY projects a reality. We offer two different classes that will enable you to turn your drab furniture into a beautifully rehabbed piece. Our "Paint a Piece" class will teach you all the basics of painting while walking you through your project step by step. In this class, you will supply the piece to be painted and we will supply the rest of the materials needed. When you leave the shop you will have a finished product you can be proud of! Our "Finishes" class is a more advanced level class that will walk you through five or six different finishes that we offer that take a piece from drab to fab! We supply all the materials for this class. When you leave this class you will have samples of all the finishes learned and the knowledge to reproduce them on larger pieces. Each class is held once a month and has limited spaces available. Call our shop today in order to sign up for one or more of them so your can start making your DIY dreams a reality! This was a pretty little buffet that was only in need of a facelift. Sometimes we get pieces in and all they need is cleaning or just a little touch up. When using paint, it's okay not to paint the whole piece. In this case, leaving the front legs and stretcher natural give the piece some interest. We also changed out the glass hardware for something that would have been a little closer to what would have been on the piece originally. This buffet has already found it's forever home on the set of Outcast. This double bow front was in beautiful condition when we brought it in, but the client who purchased it needed it to be lighter to fit her décor. Instead of painting the entire piece again, we decided to leave the top stained and only paint the base. It gives the piece a great feel and helps the top remain very durable. 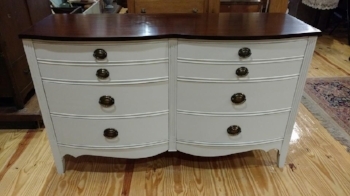 This style of dresser is very popular for many uses. I have seen people use them as originally intended, as TV console tables, as vanities, as buffets, and I'm sure I am leaving out some of their uses. The color combination used on the pictured bow front is a very popular one. The ivory or cream color softens the look of the piece, while the stained top continues to give the piece it's natural feel. At Vintage on the Hill we strive to supplement our vintage and antique furniture with home décor that compliments the style of any home. We carry various items crafted of wood, metal, and glass that will add beauty to any room. Don't see what you are looking for? Contact us or come by the shop to discuss any custom pieces that you would like to have made. We also stock a few lines of candles which include Rewined, Warm Glow, and Produce. Vintage on the Hill carries a line of bath and spa products by 1818 Farms out of Mooresville, AL. This line includes shea crème, cold poured goats milk soap, bath truffles, linen spray, bath tea, and other luxurious products. We are very excited to begin carrying the customizable jewelry line by Lenny and Eva! This line is made up of leather and beaded cuffs with metal stamped plaques and metal charms. You can mix and match and create a piece that is uniquely you. Our selection of 1818 Farms bath and spa products..
Lenny and Eva is here! We are now carrying a large selection of pieces for you to create your own unique piece of jewelry! Do you love candles as much as we do? At Vintage on the Hill we carry Rewined, Warm Glow, and Produce candles that will fill your home with divine scents.